Simon, the fun-yet-frustrating memory skill game co-developed by the late Ralph Baer, is back with a modern twist. Originally launched way back in 1978 by Milton Bradley (which has since been taken over by Hasbro), Simon is a handheld toy with four colored buttons that each produces a unique tone. To play, a user must watch for (then recite) a random pattern of colored lights. The pattern gets progressively longer after each round. New for the modern era is Simon Optix, a wearable toy that brings the gameplay up close and personal. 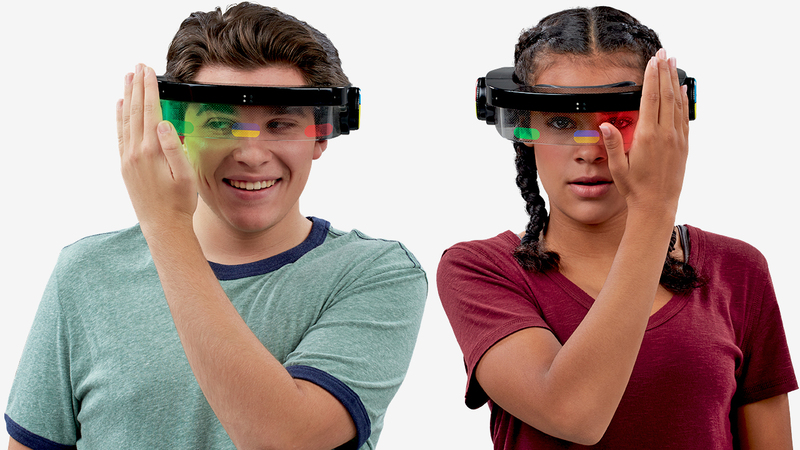 As Engadget recounts from Toy Fair 2017, Optix features a transparent visor in which specific colors of light – green on your right, red on the left and blue and yellow in front of you – flash in front of you. Like the original, you’re presented with a pattern of colored lights that you must remember and recite back although instead of pushing physical buttons, you simply wave your hand in front of the quadrant of the visor corresponding to the colors you just saw. Sensors on the outside of the visor will determine if you pass or fail. It’s the same basic concept as before, just with a bit more technology baked in. Engadget says the headset can connect wirelessly via line-of-sight infrared with up to 100 other units for some serious multiplayer. Simon Optix comes out this fall in time for the holiday shopping season and will sell for $25.